That’s right, it’s time for a date episode! I didn’t expect Chi-chan to make a move on Maou so quickly, but I guess she isn’t holding back when it comes to him. We also get some elaboration on the mysterious earthquakes and the magic attack from last episode, but the culprit’s identity remains hidden. Maou-sama! keeps up the laughs with some rather humorous moments this episode. I feel a little bad for Yusa as it comes at her expense most times, but it’s just too funny to hold back a chuckle or two. When Maou and Ashiya get taken in by the police for possible connections to the recent string of attacks and robberies, they call Yusa in to bail them out. Needless to say, the hero is furious at having to assist her mortal enemy, but I find it rather telling that she helps them all the same, albeit grudgingly. From mocking her behind her back1 to unapologetically causing her trouble, the duo of former demons certainly have a knack for eliciting hilarious facial reactions from the poor hero. Yusa really needs to learn how to keep her emotions in check if she doesn’t want to keep embarrassing herself in public. Although, given the publicity chuunibyou is getting from recent anime, her talk of heros and demons might not raise all too many eyebrows. Boy oh boy, does Chi-chan move fast. We’re only three episodes in and she has already secured a date with Maou. Granted, Maou probably doesn’t understand the gravity of the situation even though Ashiya tried to not-so-subtly hint at Chi-chan’s feelings. But it’s progress for the girl nonetheless. Having her confess so soon would be too easy though, so we get the obligatory interruption in the form of Yusa, followed by a massive earthquake. At least no one’s getting obliterated by lasers here.2 And at this point, Yusa still claims she is at odds with Maou. But I wonder how much of her interrupting Chi-chan’s confession was genuine concern for an innocent girl, and how much was unconscious jealousy. Yusa has certainly become rather possessive of Maou, even if this possessiveness comes in the twisted form of “I must be the one to kill him”. With just a little nudge (which the end of the episode almost supplies), I’m sure her feelings can easily change from simple obsession to romantic obsession. Or maybe she’ll become a yandere? She certainly possesses facial expressions fit for the part. Watch out, Maou! With the romcom out of the way, let’s get on with the plot. The assailant from the previous episode is hinted to be a demon from Ente Isla. Or at least, Yusa makes him out as such from his threatening call. And honestly, I can’t see any of the hero’s companions acting like this anyway, which leaves only the demons. I suppose their loyalty to the demon lord isn’t as deep as initially suggested, or perhaps this particular demon is just ambitiously looking to claim the title from the now de-powered former owner. There’s also the mystery of the voices that Chi-chan hears in her head, and while it’s tempting to connect the two, I get the feeling that the voices aren’t actually communicating with the demon in question. The language they use suggests the voices are trying to contact Yusa instead. But at this point, I’m honestly not sure. 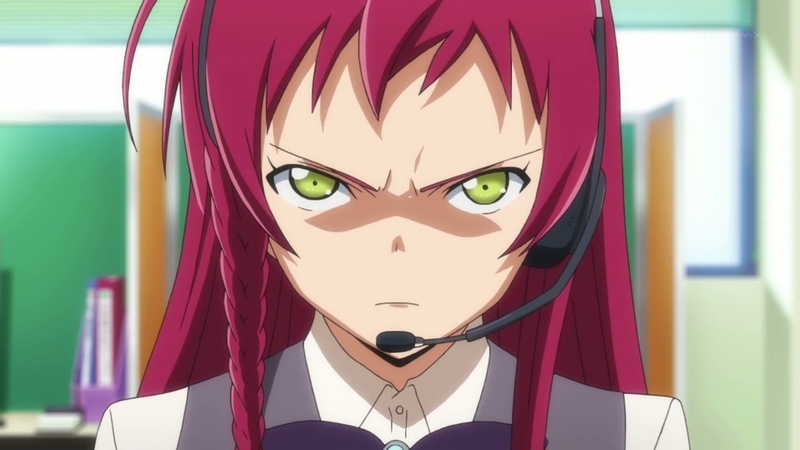 Hataraku Maou-sama! made short work of Maou’s acclimation with our world, but what previously seemed a comedic element now appears to have some serious consequences. Has the demon lord really gone soft? The very beginning of the premiere had us believe him to be an absolutely vile fiend, but here we see him saving humans after finally regaining his magic. This is enough to shake even the beliefs of Yusa, who was prepared to strike Maou down the moment he turned his back to her. Perhaps she will take this as a sign that he has reformed, and will make good on her word to let him live in peace on Earth? 1The more frequently cited idiom is mutton dressed up as a lamb. Here, Maou and Ashiya have swapped the positions of mutton and lamb for obvious reasons. Albeit later subverted in Valvrave. I thought the shift to a more serious plot went well. Hopefully they won’t bungle it. There are lots of shows that started off good when it was mostly a comedy, then they tried to get serious later only to destroy what was good about the show. Oh gosh they made him SO MANRY AND BUFF in his demon form XD well, that was supposed to be a half-transformation o3o but BUFF Maou is fine too. with someone plan get both satan & emi wonder what to expect in later eps? Haha, yeah. 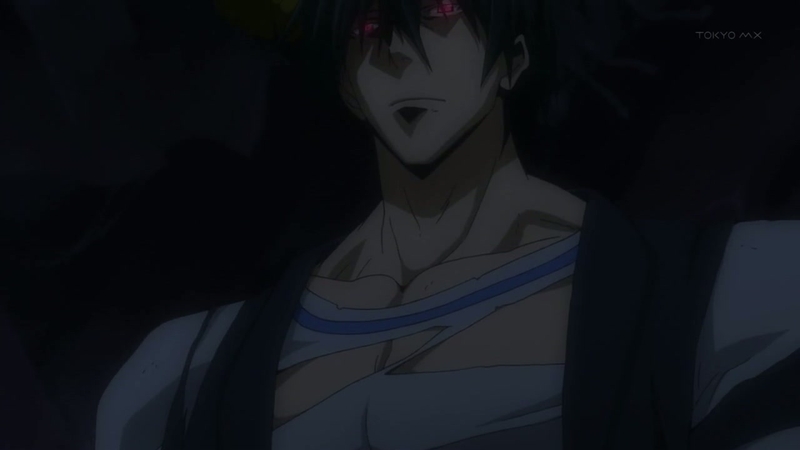 Maou is looking pretty beefy in his demon form. I’m not sure but he looks a lot more buff here than he was when he left Ente Isla. Trivia: Uniqlo is a famous Japanese casual wear brand. where kuro=black, and shiro=white in kanji and hiragana writings. My guess would be that the enemy targeting both Maou and Emi is one of the other demon generals who did survive and wants them out of the way so he can conquor their world. Second guess is that the voice Chi hears is one of Emi’s companions. If the latter is correct, that would suggest that in the future Chi would play a bigger role than that of the girl who loses out to the heroine in a love triangle. And Chi, you go, girl! It’s refreshing to see a character in a romcom who doesn’t get all tongue tied and shy around her love interest and never gets the courage to confess. It’ll be interesting to see how much of a shift towards drama this series takes and how much comedy it retains. Koturo-san mostly managed the balance quite well. Let’s hope Maou-sama does as well. A nice balance of humor and serious plot. It’s difficult to keep in mind that this is the same guy who was once a feared demon ruler. His happy-go-lucky side since coming to Japan is dominating him and I think he’s starting to accept that. Even if he has his powers back, going back to his original plans won’t be an easy choice anymore. The earthquakes are surely the work of someone who wants a rise to power now that Maou is stripped from his previous glory and is making sure there is no room for error by taking him and Emi out. Chiho suddenly understanding Ente Isla’s language means she’s also going to get roped in. I was hoping for Chi-chan’s confession to see how Maou would react but Emi’s interference ruined it big time. She calls him merciless and cruel but with her bright yellow eyes and the way she glares at people, she looks more like a demon than he does. Chiho calling her Maou’s ex was an awesome retalliation and a nice blow to her pride. Emi doesn’t want to admit it because she’s still clinging to the past but she knows she’s beginning to fall for him. It’s simply a matter of time. If I may invoke the laws of anime, Emi is technically the first girl to appear, so she must win by default. Which is a shame, because I’m more inclined to root for Chi-chan for her efforts. Laws are meant to be broken, Highway, otherwise people wouldn’t be so tempted to do so. Maybe Chi-chan will end up together with Ashiya, although it’d be a nice switch if it were Maou & Chi-chan and Emi & Ashiya. I think I’d prefer that. Either ship between the four would be acceptable. Their good qualities outweight any bad ones they could possibly have. That’s something that’s not seen very often.